Gauge the values, priorities, and preferences of the crowd. 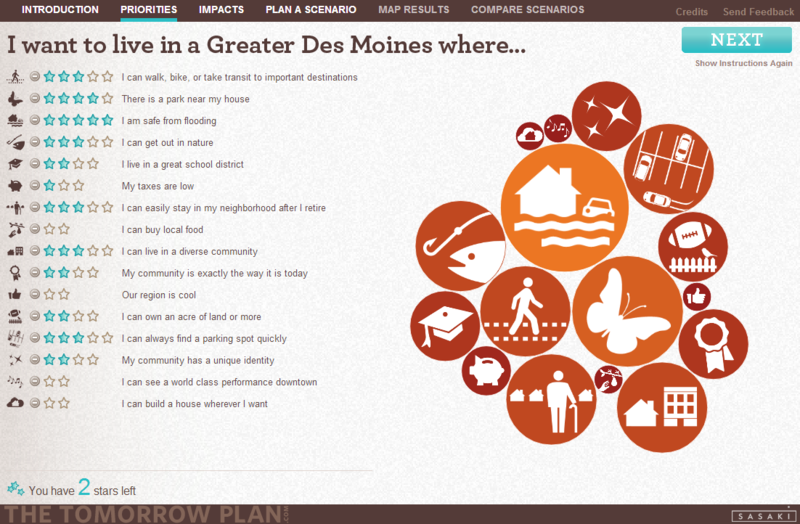 Sasaki Associates first developed the platform in partnership with the Des Moines Area MPO (DMAMPO) as part of The Tomorrow Plan, a regional plan for sustainable development in the Central Iowa region. The original game, named DesignMyDSM, can be played here, and some of the analysis is discussed here. (Read more about the development process here). Building on the success of the The Tomorrow Plan, PlaceMatters, DMAMPO, and Sasaki have formed a collaborative partnership to pool expertise and resources to assist regional and municipal planning agencies across the country with tools and techniques for more effective stakeholder engagement, visioning, planning, and community development. This product is now available for use. In the spirit of open source, we are pleased to share this front-end tool with the planning community, as well as other groups interested in applying CrowdGauge to any situation where it is meaningful to demonstrate how a series of actions or mechanisms relate to people's priorities. We are excited to see the clever applications and brilliant new iterations we will all build next. 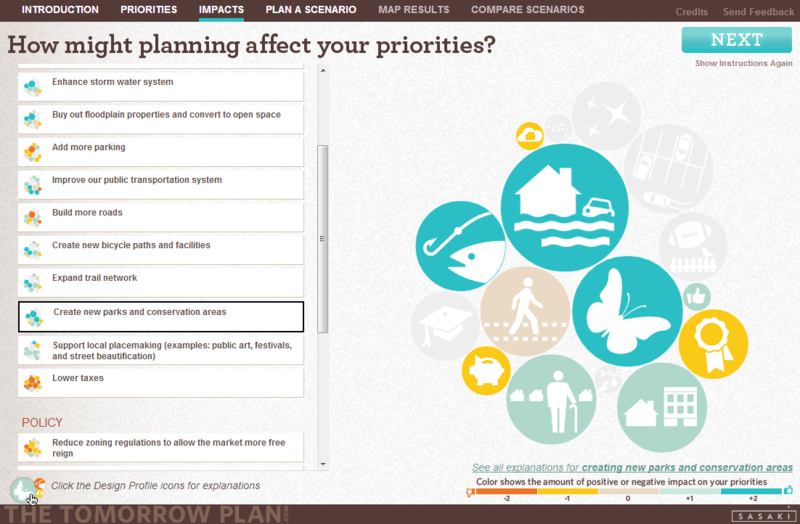 The first screen asks users to consider and rank a set of priorities that affect them. The circles on the right are re-sized to reflect their preference. The second screen lists a series of mechanisms and discusses how each of these would affect the user's priorities. 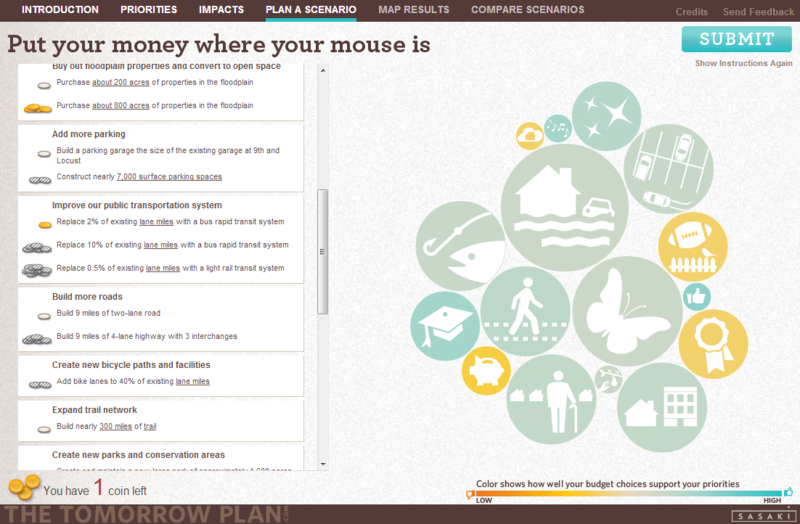 The relative size of the circles is used to highlight the priorities that matter most to the user. Mini charts on the left provide a quick overview for each mechanism. The third screen provides specific actions for each general mechanism. Each action has an associate cost and the user is asked how they would allocate a limited budget. The circles are now colored to indicate how well their choices serve their priorities.